Among Scandinavian flags, all flags show the Scandinavian Cross (also called Nordic Cross or Crusader's Cross) as illustrated above. The "Cross Flag" is Scandinavia's historic flag pattern showing a + stretching to all four sides of the flag. The vertical bar of the Scandinavian Cross is moved toward the flag's left side. All Scandinavian countries use this basic traditional design on their flags but individualize their flags in color and other (minor) flag details. Due to the individualization of the Scandinavian flags, the countries' flags are easy to distinguish. The very first flag showing the Scandinavian Cross was Denmark's national flag, called the Dannebrog in Danish. Later, the flag's cross design was adopted by other countries in the Nordic region although the colors differed. 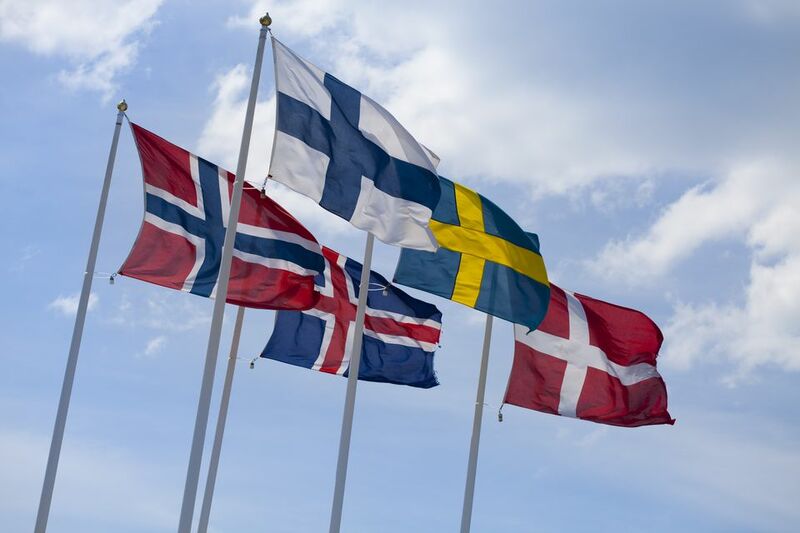 The flag colors have very specific meanings for each Scandinavian country. The first flag with three colors was the flag of Norway. The flag of Denmark has the colors red and white and is considered the oldest continuously used flag of any country. Called the Dannebrog in Danish ("Danish Cloth" in English) the flag of Denmark had come into existence no later than the 14th century. The widely known red and white flag became Denmark's official national flag in 1625 and serves as the base for all other Scandinavian flags. In fact, the so-called Scandinavian Cross on the left of the Danish flag is repeated in all other flags of the Nordic region. Flag variations are based on color to distinguish the flags. The flag's cross in white color is a symbol of Christianity. Danes fly their national flag on public holidays, birthdays of members of the royal family, as well as military flag days. The flag of Sweden shows the Scandinavian Cross (a cross offset to the left, based on Denmark's national flag) with the flag's colors being blue and gold or blue and yellow. The colors of the Swedish flag are based on the Swedish national arms. Using these colors to represent Sweden reaches back to 1275. The flag of Sweden has no concise date of introduction but it is presumed that the Swedish flag design dates back to the 16th century. Concrete evidence that the flag of Sweden looked the way it does today goes back to the 1960s. The flag of Finland is white with a blue cross extending to the flag's sides, and the vertical part of the cross is shifted to the left (the style of a Scandinavian Cross). This flag is Finland's national flag, first adopted in 1918. It is the officially used flag, representing Finland worldwide. The blue and white colors are taken to represent water and snow, both of which Finland is famous for. The flag's Finnish name is Siniristilippu. The flag of Norway has the colors red, white, and blue, and is the official flag of Norway used to represent Norway worldwide. The flag mirrors the Scandinavian/Nordic Cross (a cross offset to the left) and the Dannebrog, the flag of Denmark. Norway's flag colors are based on the French flag. The current flag design was introduced in 1821 when Norway was no longer ruled by Denmark. It later became the officially recognized flag of Norway. The design is based on the Nordic cross and reflected the tradition established by Sweden and Denmark, two neighboring Nordic countries. This flag is relatively modern and it is not easy to determine what the earliest design of the flag of Norway was under various rulers. Some ancient Norwegian flag designs, however, are known. For example, Saint Olav's flag contained a colored serpent within a white mark which was flown at the Battle of Nesjar. A raven or dragon was a popular symbol prior to that time. Magnus the Good also used a serpent, while the raven was flown by Harald Hardråde and other Vikings and rulers from the 9th to the 11th century AD. Around 1280, the Norwegian Eirik Magnusson flew a flag containing a golden lion with ax and crown on red, which turned into today's royal Norwegian flag with the lion. On a national level, the first officially "Norwegian" flag is considered the Royal Standard flag that is known and used today by the royal family on its coat of arms. The Norwegian flag is not folded, like in some other countries. Instead of folding it, the Norwegian tradition is roll up the flag into a cylinder shape, lower it, and place a tie around the rolled flag. The Flag of Iceland has been Iceland's official flag since 1915. The flag was approved by the king in 1919 in the colors blue and white and became the national flag when Iceland gained independence from Denmark in 1944. Meanwhile, red was added to the flag of Iceland so as to connect Iceland's history to Norway's. The flag of Greenland is Greenland's official flag, in which the flag's symbolism shows the white of ice and snow and the red circle as the sun. Being a Danish territory, Greenland's flag is kept in the traditional colors of the Dannebrog, Denmark's national flag. The Flag of Åland shows the Swedish flag in the background to which a red cross has been added. The red color on the flag of Aland symbolizes Finland. The flag has been the official flag of Aland since 1954. Having been a Swedish province in the Middle Ages, Aland is now an autonomous Finnish province combining the two countries even in its flag. When the Åland Islands received more autonomy in 1991, the Åland flag became a civil ensign in a new flag law. The flag of the Faroe Islands is a flag showing the Scandinavian Cross and the colors white, blue, and red. The flag of the Faroe Islands is called Merkið and has its own holiday, Flag Day on April 25 (Flaggdagur). The white coloring of the flag of the Faroe Islands stands for wave crests, while the red and blue are the colors found in traditional headdresses on the Faroe Islands. The flag of Skåne is a flag with the Scandinavian cross in the flag colors red and yellow. The flag represents a region in South Sweden, called Scania. This, in Swedish, is Skåneland or Skåne. While the flag of Skåne represents both areas, the Skåneland region includes a larger area than the historical province of Skåne alone. The flag of Gotland is not an official flag and is currently not being used as a public flag. This design for Gotland's flag was suggested in 1991 with green and yellow being the colors of the flag of Gotland. The local government has not taken steps to adopt this new flag for Gotland, though. This flag for Öland is not officially recognized but visible on Öland island. The flag of Öland is proposed to replace the Öland coat of arms. Colors of the flag include green and yellow—green for Öland's vegetation and yellow to connect to the national flag of Sweden. The flag represents the reversed colors of the flag of Gotland, the Swedish island next to Öland. The flag of Bornholm keeps Denmark's red flag color as the background and substitutes the flag's cross with a green one (Denmark's national flag has a white cross). Bornholm's flag came into use in the late 1970s. While this flag design is not an officially recognized flag, it is in common use and easy to spot on Bornholm. Travelers on Bornholm find the flag in several places, like tourist brochures, local souvenirs, and postcards. This flag of Bornholm is also used by Danish military. This flag of Härjedalen shows the Scandinavian Cross in the colors black and yellow ​and has been used intermittently to represent the province of Härjedalen in central Sweden. This Härjedalen flag is not used for official purposes but in tourism only. The design for the Härjedalen flag first surfaced in the 1960s and 1970s locally and in travel media to promote Härjedalen. Presumably, the yellow color is meant to connect the flag to Sweden's national flag (which shows the colors yellow and blue). The yellow-black Härjedalen flag was created by Hans Stergel, a tourism manager in western Härjedalen. This is the flag of Västergötland, a regional flag of West Sweden (Västsverige). The flag of Västergötland was designed in 1990 by Per Andersson and is not an officially recognized flag in Sweden. Västergötland is one Sweden's 25 traditional provinces. The Västergötland flag represents the region of West Sweden which includes the counties of Halland, Älvsborg, Skaraborg, Värmland and Gothenburg, and Bohus. The flag of Västergötland uses yellow as the main flag color. The flag's cross is the traditional Scandinavian Cross in white, framed by narrow bands of blue. The flag of Västergötland has its origins in the flag design of Götaland, and two of the three flag colors are identical to the national flag of Sweden. The flag of Ostergotland is a flag that simply inverts the colors of the national flag of Sweden while retaining the same flag colors and shape (the typical Scandinavian Cross with the flag's cross offset to the hoist side of the flag). Ostergotland's flag is not an officially recognized flag per se, but nonetheless widely used in Ostergotland. Ostergotland/Östergötland is one of the traditional provinces in southern Sweden. This design of the Sami flag was adopted by a unanimous decision of the 13th Nordic Sami Conference. The flag of the Sami people has the colors red, green, yellow, and blue as part of the flag. The Sami flag's symbolism offers multiple interpretations. One interpretation of the Sami flag would be that the colors of the flag consist of the flag colors in Scandinavian flags and the ring represents unity. Another interpretation of the Sami flag takes the colors to represent traditional Sami clothing. The ring on the flag may be the sun, the moon, or both. Some see the four elements in the Sami flag's colors, using the large circle as a symbol for the sun. The Flag of Swedish Speakers in Finland consists of two flag colors: Yellow and red, combined in a Scandinavian Cross. The use of this flag is not very common and the flag's meaning is only known by a small group of Swedes residing in Finland. In fact, apart from the width of the lines versus the flag's proportions, this flag is identical to the unofficial flag of Skåne in southern Sweden. In Finland, a group of Swedish speakers consider this flag their traditional minority flag. However, this is not common knowledge and most identify the flag of the Swedish speakers in Finland as the flag of Skåne instead. Leaning on the flag coloring of the traditional flag, pennants striped yellow and red are often used by the Swedish speakers in Finland.